Thursday was the opening show in this year’s Ojai Festival and even though I’m headed out of town tomorrow, I drove up to catch the show. It was an all Steve Reich program including Eight Lines, Nagoya Marimbas, Four Organs, and his recently released Daniel Variations. 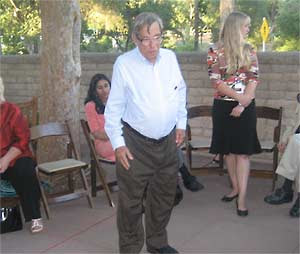 The composer was in attendance, and it was not a bad start for this year’s festival. Sure, this may not seem like the most daring program by Ojai standards, but it’s a reasonable look back at one of the world’s most important living composers. 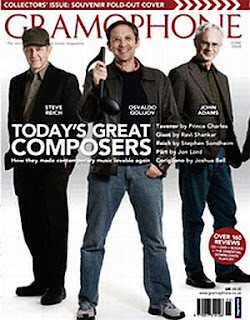 Hey, and let’s face it – you really know you’ve arrived when you make the cover of Gramophone Magazine and they don’t make you hold the silly giant plastic musical note. The ensemble Signal was joined by members of So Percussion under director Brad Lubman for an evening of solid and enjoyable performances that definitely played up the warm and friendly qualities of these pieces. There were some problems with bad microphone placement, but it was no matter in the end. I was no where near as taken with Daniel Varations as I had been during the performance by the Los Angeles Master chorale last year, so I would definitely check the new recording out. This year’s festival promises to be another strong one under guest director David Robertson, and includes a major appearance from Dawn Upshaw. In the interest of full disclosure, I should note that I attended on complementary tickets provided by the festival. I usually don’t do this and frankly this was my first experience acccepting press passes for something I saw for OutWestArts. I did it in part because the evening included a “blogger’s night” reception meant to welcome local bloggers to the festival and to help launch a major new addition to our ranks, the new blog from long-time music critic and recently dismissed LA Weekly contributor Alan Rich. Mr. Rich was present at the reception and made some brief comments about how he is learning about blogging, a new experience for him, and hopes this outlet will act as a space for community and conversation around local music events. He noted the importance of this given that to his understanding there are no “important” music blogs on the West Coast at this time. It’s nice to see that Mr. Rich’s transition from the “old” to the “new” media hasn’t burdened him with the unnecessary baggage of tact. In the meantime, for those of you not headed up to Ojai for Mr. Rich (or Alex Ross, there to promote his book and participate in a symposium) there are plenty of unimportant West Coast blogs to check out in your spare time. I will be in Europe next week reporting on all things operatic, so come back soon. No "important blogs" on the West Coast, eh? Well, thanks very much, Alan. He really said that? You bet. I was rather surprised myself. In his defense, I don't think Alan has spent much time "surfing" blogs musical or otherwise and is probably speaking from a position of relatively little information that has been passed on to him by friends who are setting up his on-line operation. As he himself has noted on his blog, he writes the stuff and puts it in somebody else's hands and it shows up elsewhere. I don't think he meant any harm by it, and it was probably just an off-the-cuff remark. Still, it did sting a little.